Jenna is unhappily married, squirreling away money, and hoping to win a pie-baking contest so, with the prize money, she'll have enough cash to leave her husband Earl. She finds herself pregnant, which throws her plans awry. 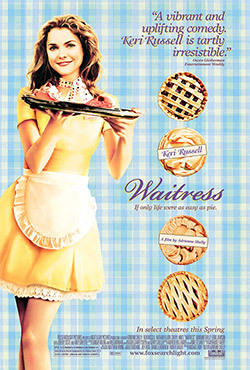 She bakes phenomenal pies at Joe's diner, listens to old Joe's wisdom, tolerates her sour boss Cal, is friends with Dawn and Becky (her fellow waitresses), and finds a mutual attraction with the new doctor in town. As the pregnancy advances, life with Earl seems less tolerable, a way out less clear, and the affair with the doctor complicated by his marriage. What options does a waitress have?